The regional election in Andalusia on 2nd of December 2018 was considered a mood test for the socialist government led by Pedro Sánchez in Madrid. The Socialists who rule in Madrid are losing in this region where they were unbeatable. And for the first time in Spain, a right-wing populist party is entering a regional parliament.The Socialist Party (PSOE) remains the strongest party in the regional parliament of Andalusia with around 28 percent of the vote, but lost 14 seats (down 7 percentage points) compared to the last election and has now 33 seats. The conservative People’s Party Partido Popular (PP) has lost seven seats and has a total of 26 seats. The right-liberal Ciudadanos were able to more than double their seats and is with 21 seats the third strongest force, an increase of 12 seats compared to the election in 2015. The Podemos offshoot Adelante Andalucia came to 16.2 percent and a total of 17 seats, making it the fourth strongest Power in front of Vox. Vox is the surprise winner of Sunday’s election. For the first time, the Spanish right-wing populist party has made it to the regional parliament in Andalusia. The party won twelve of the 109 seats, giving the right-wing parties a majority.Andalusia is the most populated region in Spain with 8.4 million inhabitants. Since 1982, all Prime Ministers have been appointed by the PSOE. In just four decades, she was only once not the strongest party in the regional parliament. The Andalusian election marks the start of a series of votes in Spain, ranging from local and regional elections to the European elections in May. Early new elections were called after the Socialists lost support from Ciuadadanos. 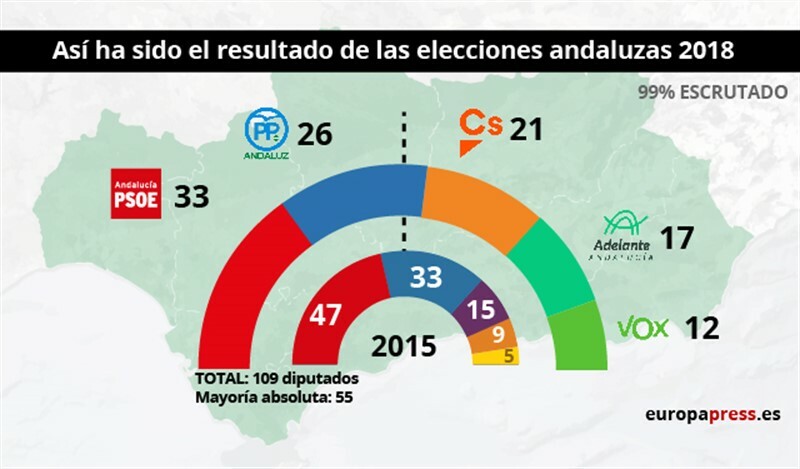 In purely mathematical terms, VOX, together with the conservatives and the center-right party of Ciudadano, has a majority in the regional parliament in Andalusia. Such a tripartite alliance, which has not been ruled out by any of the parties, would be a first in Spain.